Your kitchen is the heart of your home, as such it is important to make sure the kitchen design fully utilises the space and meet your requirements. How you use the room all depends on your individual preferences and lifestyle, which is why our expert kitchen design team take great pride in maximising productivity with innovative gadgets, space-saving ideas, contemporary design and beautiful high quality surfaces. 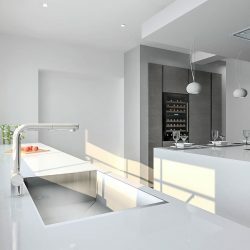 Whether you are looking to build a brand new kitchen from the ground up, or extend and update an existing construction, Silke are happy to put together a perfect kitchen design to flatter the space (or lack thereof) you have available. A wide range of layout types can be catered for, including the classic L-shaped and U-shaped kitchen design layouts, with breakfast bars and islands, all matching together a plethora of appliances, worktops, and joinery. Our full range of appliances, worktops, sinks, instant hot water taps, flooring, and accessories can be included in our world-class photo realistic 3D designs ready for you to take away. Providing an accurate representation for every design is top priority, depicting exactly how your new kitchen will look, from floor to ceiling and everywhere in between. We believe our renders are unmatched across the industry, and are sure you’ll find them an invaluable resource when choosing colour schemes and layouts. Revel in our designs created especially for you, and have them made into reality and fitted with quick turn around and minimal fuss. Contact us today for more information, and learn why a Silke kitchen is a true slice of excellence.